Johan Grimonprez, Still from Double Take, 2008. A hit of the 53rd London Film Festival 2009, Belgian artist and filmmaker Johan Grimonprez uses an assemblage of TV and newsreel material to muse on Alfred Hitchcock's unique persona and humour, holding up his legendary films of the late 1950s and early 1960s against the climate of Bomb-era political anxiety. 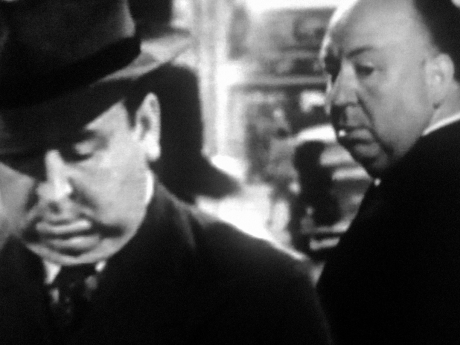 The film plays on Hitchcock's preoccupation with doubles and even features him meeting his own doppelgänger. Grimonprez achieved international acclaim with his film essay, Dial H-I-S-T-O-R-Y, which premiered at Documenta X in 1997. Johan Grimonprez is a Belgian artist and filmmaker, who achieved international acclaim with his film essay, Dial H-I-S-T-O-R-Y in 1997. His productions have travelled the film festival circuit from Telluride, Los Angeles, Rio de Janeiro, to Tokyo and Berlin. Exhibitions of his work have been presented at major museums such as: Whitney Museum, New York; San Francisco Museum of Modern Art; Pinakothek der Moderne, Munich; and Tate Modern, London. Curated by AV Festival 10. Regional Premiere.